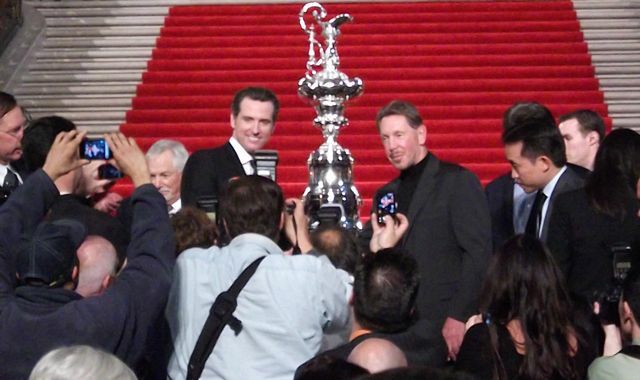 San Francisco Mayor Gavin Newsom and Larry Ellison pose with the America's Cup following Wednesday's event. For a while on Wednesday afternoon, the Commissioner’s Trophy — presented to the San Francisco Giants for winning the 2010 World Series — was only the second most valuable (and, arguably, prestigious) sporting award inside the walls of San Francisco’s City Hall. As Giants fans waited to get their pictures taken with baseball’s biggest prize, the city’s leadership turned its attention to the proverbial World Series of sailing coming to San Francisco Bay. Politicians, business leaders and the sailing community gathered in the rotunda to celebrate the city’s selection as the host city for the next America’s Cup in 2013. With the America’s Cup trophy standing nearby, several notables — including Mayor Gavin Newsom; billionaire Larry Ellison, whose Oracle Racing team returned the trophy to the U.S. after an 15-year absence; and freestyle skier and Olympic gold medalist Jonny Moseley, who emceed the event — offered thank-yous and a preliminary preview of the competition. San Francisco stands to benefit from as much as $1 billion in economic activity generated by the event, and potentially millions of visitors. At a press conference following the presentation, Newsom and Ellison both downplayed the last-minute wrangling that found the organizing committee considering Newport, Rhode Island, as an alternate venue. They characterized it as an understandable, precautionary measure, given the unprecedented investments necessary to upgrade San Francisco’s waterfront. Ellison portrayed San Francisco as a key part of his vision to make the 34th America’s Cup a more populist affair designed to generate more interest in sailboat racing, calling the bay “the most spectacular natural amphitheater for sailing that God created on this Earth.” Unlike previous regattas, in which courses have been miles out at sea, races will start in the bay near Alacatraz Island, with shoreline viewing able to accommodate hundreds of thousands of spectators. 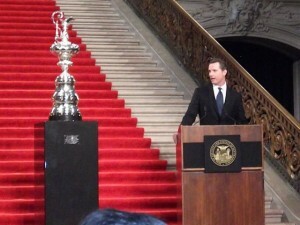 “A race that often is hard to see is going to be impossible to miss here in San Francisco,” Newsom said. Gavin Newsom addresses the crowd at City Hall. Other proposals intended to make the event more viewer-friendly include having more, shorter races with definitive start times; devising television coverage that highlights the most exciting aspects of the race; and racing in “the fastest boats in the world,” 72-foot catamarans with solid wing sails capable of exceeding 40 miles per hour. “We’re trying to convert sailing into an extreme sport,” Ellison said. Ellison avoided specifics when questioned about his long-term plans for the piers being developed, saying the current focus is on turning them into a “race village” able to accommodate sailing teams from around the world. He did say he envisions being able to “integrate the piers into the economic (and) social life of the city,” offering residents places to dine or possibly hitch a ride on a sailboat. Sailing action on San Francisco Bay will begin in August 2012, when the AC72 catamaran class will make its debut as part of the new America’s Cup World Series. The competition proper begins with the Louis Vuitton Cup — a challenger series that will determine who sails against the defending Oracle team, once again racing on behalf of Golden Gate Yacht Club under the direction of CEO Russell Coutts, in the finals in late 2013. This entry was posted in Not Necessarily Music, Urban Planning and tagged 34th America's Cup, America's Cup, not necessarily music, sailing. Bookmark the permalink.